This volume brings together Lovecraft’s complete extant correspondence with Bloch as well as with such other young writers, editors, and fans of the 1930s as Kenneth Sterling (who collaborated with Lovecraft on “In the Walls of Eryx”), Donald A. Wollheim (editor of the Phantagraph and a leading figure in science fiction in the decades that followed), Willis Conover (whose Lovecraft at Last is one of the most poignant books ever written about the Providence writer), and others. As in all previous volumes in the Collected Letters series, these letters have been meticulously edited by David E. Schultz and S.T. Joshi, two of the leading authorities on Lovecraft. Also included are many rare and pertinent writings by the various correspondents, which shed light on their relationship to Lovecraft. An exhaustive bibliography and a comprehensive index conclude the volume. H.P. 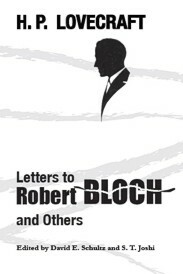 Lovecraft: Letters to Robert Bloch and Others.. By H.P. Lovecraft, Edited by David E. Schultz and S.T. Joshi. New York, NY: Hippocampus Press; 2015; ISBN 978-1-61498-137-4; paperback, 550 pages.